In years past I would of already had my Christmas Card out, being delivered today or even yesterday to most of my friends and family. But, alas, not this year. And that is okay, because we have a plan. We know what the kids will wear and I think we have narrowed down a location. Getting all the kids in the same place at the same time has been an issue. Especially since Nana has the 3 middles at the annual Cuz Buzz this weekend! 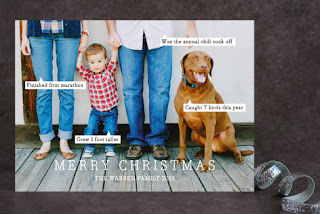 (Big Woo Hoo) And then is the ever pressing issue of where to order the Christmas Cards from. And the winner is? Minted.com has beautiful cards and there are quite a few I can't decide between. They also have this awesome silhouettes that allow you to pick out different shapes for your cards. The cherry merry with the awesome lace effect around the edges- love it! 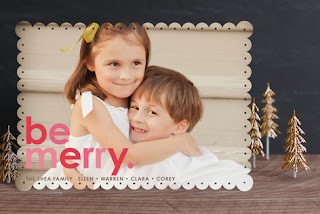 Not sure about saying Be Merry- kind of wild and crazy for this conservative fam. But, may be just what we need. And this conversation bubble card is adorable. Thinking about the captions I would choose. Maybe "Hey, I am eating solids!" for the baby or "My last year in elementary school!" for Lauren? And this one just takes my breath away- the aquarelle. I love the watercolor look of it, but not sure about aqua- they have a couple other colors to choose from for the background. What do you think? Which one should I choose? 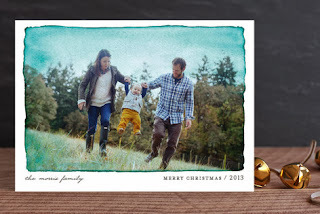 What are you doing about Christmas cards this year? *Although the opinions above are all my own, I was offered product in order to review. They all look great. I need to start thinking about our cards. We usually get them printed at Costco.